Margaret sends her and her friends’ support to Jessie. I haven't time for a letter now; am just writing to say that I am sending off your hat kimona etc etc. Mother asked me to tell you that the other book or books that you wanted, Father has not in his possession. I hope that you have not been inconvenienced inby the delay in sending the books we have. Dear, dear little Jess, I do sympathize with you so deeply in your predicament. Be sure dear if you do send a letter of resignation, to state it in the plural number, and send it to me to sign. If you would rather I swill write a separate one. At any rate tell me when you send your's so that I can send mine at the same time. I told Myra and Caroline both about what you and Flora had decided to do. They were both very sweet, Myra especially, who said that she knew that if you did resign, you two, she knew that you would be doing it conscientiously, and that nothing could result from your resignation that would not turn out for the best in the end. I just loveMyra. She is so broad-minded and philosophical about everything Of course they were both very much distressed. Caroline refuses to believe it until it is done. You may be sure dear that whether you stay in or out we will all here at home have perfect confidence in you that you did the right thing. I shall write later of my two happy visits. 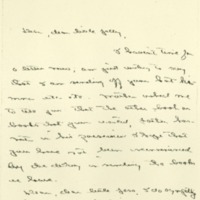 Wilson, Margaret Woodrow, 1886-1944, “Margaret Woodrow Wilson to Jessie Woodrow Wilson Sayre,” 1907 October 2, WWP17404, Jessie Wilson Sayre Correspondence, Woodrow Wilson Presidential Library & Museum, Staunton, Virginia.